When most of us think about deep fryers, we associate them with fast food stores. But once we move past that thought, we think of the delicious, crispy food being fried to perfection. Deep fryers used to be an expensive appliance to run, requiring gallons of oil and plenty of electricity. Nowadays, deep fryers have become very economical, making the process quite simple and inexpensive. However, if you are looking at getting one, you still need to concern yourself with is quality, speed, and safety. In this article, we will take a look at the top five deep fryers, each with its own purpose, to see which one is best for your needs. What is a deep fryer? How to use a deep fryer? What to cook in a deep fryer? How to choose a deep fryer? 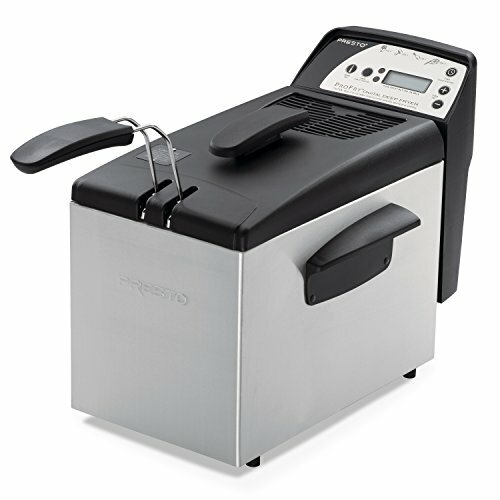 This Presto deep fryer is professional style in a convenient home sized package. The basket can accommodate up to 9 cups of food, making it perfect for smaller family gatherings and evening meals in a flash. This powerful 1800 watt deep fryer has a heating element that is immersed for fast preheating and quick recovery. The adjustable thermostat allows you to set the deep fryer to the exact temperature that you want. The 30 minute timer is a great safety feature that ensures that the machine will switch off should you forget it. The digital display and control has an LED signal light that lets you know when the fryer is up to the correct heat, among other features. The heating element and the pot are removable for easy cleaning. The lid has a filter which releases the steam while containing the oils odor. This compact deep fryer will easily fit onto any kitchen countertop and is ideal for cooking your family’s favorite fried foods in minutes. The power cord is attached to the back of the fryer with magnets, making it easy to attach or remove as needed. The fryer is also very easy to clean. The handle for lifting and lowering the basket does not stay in the prongs. Some users found that the unit did not maintain its temperature very well once the food was added to the oil. This Hamilton Beach deep fryer is a fairly large device without being too big for your countertop. It is perfect to cook up your family’s favorite fried foods, and there is plenty of space to throw in some extra food for your friends too. The first highlight of this deep fryer is its size. It has an 8 cup capacity for food and a 12 cup capacity for oil. You can also adjust the temperature of this appliance very easily, making it a versatile cooking unit. The design of this deep fryer is professional and sleek, making it perfect for any countertop. The large 8 cup capacity means you can cook crispy, fried food to perfection. The heating element is immersed which means that the oil heats up quickly and cooks your food perfectly. Thanks to the lid’s design, you can lower and lift your food into and out of the oil with the lid closed to ensure that there is no splattering of oil. This Hamilton Beach fryer is ideal for your home and is easy to clean. The stainless steel body makes this fryer durable and sturdy. The breakaway cord makes cleaning and storage quick and easy. This deep fryer is great value for money. It is not a cheap model, but it is well worth every cent that you pay. It is durable and has plenty of features that you will enjoy. Plus, the large capacity makes it ideal for making decent amounts of food for your family and friends. The exterior of this deep fryer gets extremely hot, so you must handle with care, especially if there are young children around. The lid of the fryer does not have a filter to release the steam while keeping in the odors, but rather has a vent that releases the steam as well as the odors. This company has been in business for a long time, which tells you that they know what they are doing. This large capacity deep fryer is great for cooking up large amounts of food, and you can rest assured that the quality of this machine is guaranteed. Like most Hamilton Beach fryers, the main feature is the capacity. You can feed a small army using this machine, and thanks to its double basket, you can cook different foods in it at the same time, halving your cooking time. The timer system is a nice addition that ensures your safety. You can set the timer so the food doesn’t burn and that you don’t forget to leave the machine on by mistake. Despite having a very simple design, it looks great in any kitchen. Plus, it is easy to clean. 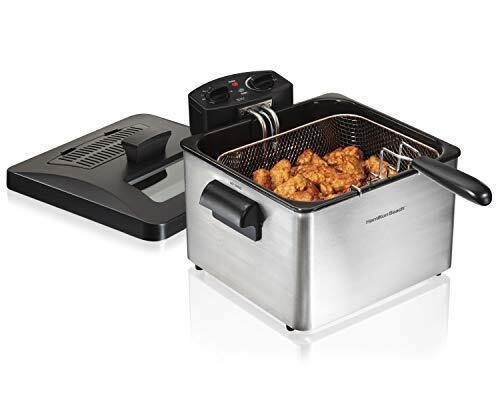 This deep fryer comes with three included baskets – two small and one large – with hooks that allow you to easily drain the oil from your food. The two small baskets let you cook two foods simultaneously while the large 12 cup capacity basket makes jumbo portions. The heating element is immersed so the fryer heats and cooks your food faster. The timer and the temperature are both adjustable and the lid has a viewing window, so you can monitor how your food is cooking. Cleaning a deep fryer is normally a real pain, but the detachable elements of this device make it really simple. It is also really easy to put it all back together again, so you can get right back to frying your favorite foods in no time. This deep fryer has a slow heating time, which can be a bit irritating. The lid doesn’t have a filter and it also doesn’t flip up. This means you have to remove the lid each time. Cleaning the fryer can be cumbersome due to its large size. It also takes up quite a lot of storage space. This deep fryer is a monstrosity, allowing you to fry two items simultaneously. You will never have to let one food get cold while cooking another. The build is stable and solid thanks to the use of stainless steel, which is a must in the deep fryer world. This double deep fryer has a very impressive capacity and fits conveniently on your countertop with ease. The automatic timer allows you to make the machine work up to an hour in advance, so it is always ready to go. The Secura deep fryer has temperature settings from 250 to 375 degrees, which is much more versatile than most deep fryers. The removable oil tank makes cleaning up quick and easy. 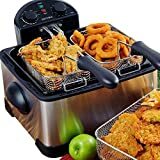 This deep fryer comes with three baskets: two smaller side-by-side baskets that allow you to cook two different foods at the same time or for foods that have varying cooking times, and one large basket for large portions of food. All three of the baskets have hooks that allow you to drain the oil from your food in a safe and mess-free way. The baskets are also dishwasher safe for quick, easy cleaning. The large 4.2 liter cooking oil tank is ideal for making food for your whole family or a gathering with friends. The stainless steel body ensures durability and stability, while the viewing window allows you to keep an eye on your food as it cooks to perfection. The activated carbon filter also reduces the odors emitted from the deep fryer, making it ideal for use in your kitchen. The lid has a magnetic break-away that allows you to safely lift it and check on your food and the splatter guard ensures that you do not get any oil burns or messes. This deep fryer is a powerhouse. The 1700 watt motor is powerful, making frying any food a quick and easy task. The oil is heated very quickly, and you never have to worry about burning or overcooking your food thanks to the built-in timer. Placing large amounts of food into the baskets can result in the hook not holding to the side of the fryer. Some users also claimed that the steam from the deep fryer smeared the temperature markings making it hard to set the exact temperature when cooking. If you love entertaining or plan on cooking large amounts of fried food at fairs, festivals, or the neighborhood cookout, this fryer will suit your needs perfectly. 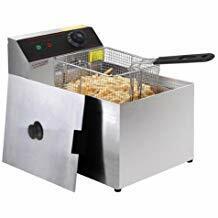 This stainless steel deep fryer is a heavy duty commercial frying machine. The isolation switch ensures that that you can safely switch off the machine if there is a problem. You can easily remove the electrical head and oil tank to make cleaning a breeze. The temperature ranges from 140 – 392 degrees and the temperature controller is conveniently located for easy control. The stainless steel lid prevents the boiling oil from splashing when you lower or lift food from the oil. The residue plates also filter out any dregs that may remain in the oil. This fryer has a stainless steel immersion element that heats and cooks your food quickly. The non-slip feet ensure that no accidents happen, and make it ideal for countertops at home, restaurants, fast food stands, or at the neighborhood cookout. Thermostat control and indicator light,Immersion type stainless steel tubular element,Single tank Comes with FREE stainless steel fryer basket and plastic handles for preventing scald,Comes with "reset protecting button for overheating"
The large capacity of this fryer is surprising considering its fairly compact size. It is also great value for money and will last for many years to come thanks to its durable construction. The machine is quite heavy and large to move around so it really is a put in one place type of fryer. As it is so large, you have to heat up a lot of oil even if you just want to cook a small portion. A little bit of common sense can really go a long way when you are dealing with a deep fryer. When purchasing a deep fryer, these are some features to keep in mind to ensure that you not only get the best results but that you are also safe when using your fryer. The main types of deep fryers are an electric and a propane fryer. An electric deep fryer is ideal for indoor use and is the most common type. You simply plug the unit into a power socket and you can safely and easily fry your favorite foods. These fryers are also typically quite compact, making them easy to place on your countertop and to store. Propane deep fryers are also called outdoor deep fryers. They have more risks when in use, which is why they are best used outdoors. Despite their bigger safety risks, they produce better results than electric deep fryers. These fryers also heat the oil faster thus cooking your food faster. When it comes to food, especially fried food, you need to think big. Of course, buying a fryer that can hold enough food for your family is great, but consider whether you entertain regularly and factor that number into your decision. It is better to buy a deep fryer with a bigger capacity than what you need than less capacity than what you need. No matter how often you have worked with a fryer, you always need to keep safety in mind because you are working with boiling hot oil. There are some safety features that are well worth the extra money. Cool-touch sides with handles are a big plus, especially if you need to move your fryer from one place to another. Most deep fryers come with a lid to cover the oil and food, preventing splashing on you and your kitchen surfaces. Check that the lid has enough ventilation to let the steam escape without letting the oil splatter out. Rubber feet are also important to ensure that the fryer does not slip off the counter. Naturally, the cost of a deep fryer is directly related to its features, particularly safety features. Before looking at fryers, set a budget so you know your price range. The most affordable options are electric deep fryers and these are suitable for small to medium sized families (up to around 8 people). If you plan on hosting parties or have a bigger family, a propane deep fryer will work best, but they can cost up to twice as much as an electric fryer. There are also other costs to consider when purchasing a deep fryer. The most expensive cost when using a fryer is the oil. Once the oil is spent, you need to replace it or the taste and quality of your food will be affected. The oil needs to be changed regularly, so ensure you purchase a fryer that has an easy draining system. 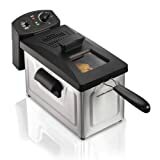 The best deep fryer will come with a thermostat to monitor the temperature of the oil and a variable temperature controller that can be used to adjust the temperature. The fryer you choose should be able to reach at least 375°F. There should be enough space for the amount of food you want to cook and a bit more. The lid should ideally be hinged rather than come right off, and it should have an odor and grease filter. Check that there is a built-in drain valve, so you can easily empty the oil from the fryer. There are accessories that are common to a deep fryer, the main ones being deep fryer baskets, a cooking oil pump, and a thermometer. When using a fryer, you need to use a basket to get the food you are cooking back out of the hot oil. Most deep fryers come with a basket, but you may need to purchase a different one based on the food you are cooking. A cooking oil pump is used to get the oil out of your deep fryer. This is especially useful if your fryer doesn’t have an oil drain. The most important part of cooking with a deep fryer is monitoring the temperature of the oil. If your fryer does not have a built-in thermometer, purchase one separately. This is probably the most important question to answer. A deep fryer is an appliance that allows you to fry your food using oil. It is a relatively safe device to use, especially with all the modern safety features that have been included. Cooking with a deep fryer is fairly simple. Start by filling the deep fryer with oil to the fill line. Turn the machine on, set the desired temperature, and wait for it to heat up. Check that the food you are frying is dry and place it in the frying basket. Once the deep fryer is up to the correct temperature, slowly lower the basket into the oil. Set the timer and wait for the food to fry. Keep an eye on the food to ensure that it doesn’t burn. When the food is cooked, carefully lift the basket out of the oil. Let the food sit and dry for a moment. Serve and enjoy. Cleaning your deep fryer is the most time consuming part of owning a fryer, but it is important to clean and maintain your unit to keep it working safely and properly. You first need to drain the oil from your fryer. Most deep fryers have a drain valve, but if yours doesn’t, you will have to pour it out from the fryer itself. Remove the heating elements and basket before you start. Most stainless steel baskets are dishwasher safe. Clean the fryer using hot water and dish soap. Do not scour the inside of the fryer. There are a wide variety of things you can cook in a deep fryer: from fish, fries, and chicken, to doughnuts and batter-fried shrimp. Any food that is deep fry-able can be cooked to crispy perfection in your deep fryer. If you are feeling adventurous, you can even deep fry your vegetables for a crunchy treat in your five-a-day. When choosing a deep fryer, there are a couple of factors that will influence your decision. Cost is the biggest consideration followed by the capacity of the fryer. Of course, features such as automatic shut off, a thermometer, and an easy drainage system are important too, but they come down to budget. Look for a deep fryer that has the basic features you are looking for with the necessary capacity within your price range. Always pick the best fryer within your budget, and always look for one that has the best safety features. The most important consideration when buying a deep fryer is whether the device you choose can reach and maintain the heat needed to fry your food properly so that it is crispy and delicious. The hotter the oil is, the less it will be absorbed into your food, keeping it relatively healthy. All of the above fryers are capable of reaching these temperatures, making them great options for your kitchen. Our recommendation is the Hamilton Beach (35034) Deep Fryer thanks to its large food capacity, double baskets with an addition large basket, and the detachable elements for easy cleaning. What a winner!